Among the millions tuned in to BBC Planet Earth II each Sunday is a West Country doctor who has first-hand experience of the programme. Dr Lucy Obolensky, mum of two, GP, Emergency Department Staff Grade, and programme lead for the MSc Global and Remote Healthcare at the University of Plymouth's Faculty of Medicine and Dentistry, has recently supported Sir David Attenborough as a medic in the hot air balloon for the opening scene of Planet Earth II. So, what was it like to work with one of the world’s most popular and respected television presenters? Lucy’s passion lies in running hospital partnerships in Kenya, setting up primary health care services and initiating – the Kenya Orthopaedic Project; Team Talk; the Nanyuki-Torbay Partnership, and; founding the charity Exploring Global Health Opportunities, an umbrella charity that supports health and social programmes throughout Kenya. Since 2000 Lucy has completed over 20 expeditions, including to Africa, South and Central America, India, Tibet, Cambodia and Vietnam. 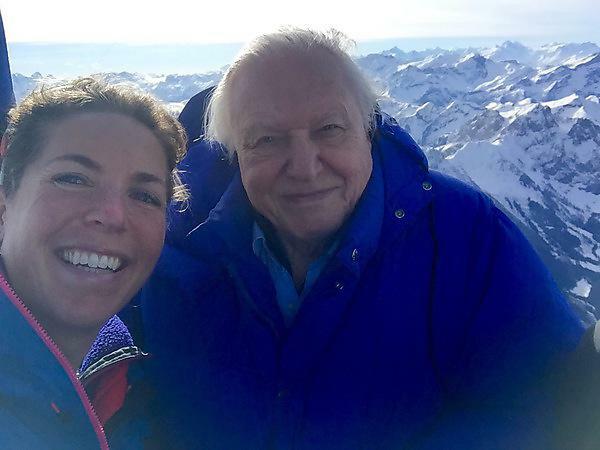 She was the medic for the Help for Heroes Kilimanjaro Summit and she also teaches advanced medical skills to explorers and expedition leaders at the Royal Geographical Society and the BBC. Increasingly she is providing training to families planning that ‘once in a lifetime’ trip to remote and challenging parts of the world. One organisation with which Lucy has a close working relationship is The Northern Rangelands Trust. This is an organisation which supports communities and conservation in an area of northern Kenya which borders Somalia. The area is volatile, with border clashes, inter-tribal fighting, destruction of the land and the killing of wildlife. Over the past four to five years Lucy and colleagues have helped the Trust and local communities to implement a health care system where there was previously nothing and where people live at least six hours away from the nearest functioning hospital. They have achieved that by bringing a whole new level of communication between various agencies, resulting in a coordination of services and effort.